If it's exclusive to Target in the US, then it's usually an exclusive somewhere else in Canada. Never saw the wounded one in my local Target since my local Target's funko section is a mess. Instead of restocking them, funko decided it was best to make a version with Deadpool. Definitely. No Fishbowl = No Mysterio. Meanwhile, i'm amazed by the amount of people who are all like "What? Why is Mysterio being a hero?" Like, do you have no idea who Mysterio is? Do you not get that it's obviously a ploy? Ugh. The only real downside of being a comic fan for decades now that comic-films (and Marvel in particular) are popular is having to see idiots ramble about things they don't even bother to understand. Yeah, it's pretty much like when you have a fave indie band that you're into, and then they sign with a big record label and have a top 40 hit, and you're all like "Pshhh. I was into them before it was cool!" I mean, I'm not gonna front like I'm not guilty of being a hipster fangirl. 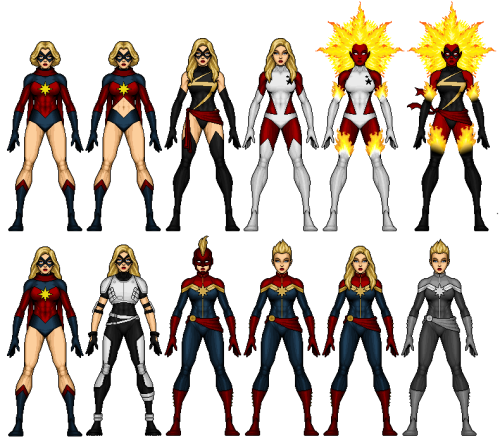 for example, I am SUPER stoked for the Captain Marvel movie, because I'm really excited for new fans (women and girls especially) to meet one of Marvel's coolest characters. I'm not one of those jerks that's like "muh you're not a real fan, who drew the first story arc in 2012 dur," but internally (just a little bit!) I'm like "I've been reading Carol before she was cool heck yeah." But here in Indonesia, we will get Partial Lunar Eclipse. I think you mean the Super Blood Wolf Moon Lunar Eclipse U Deluxe 2K19. Ha, yes! I too am psyched for Captain Marvel, but do have to internally suppress that "Don't you know Carol is where Rogue got like half her powers after absorbing her consciousness? And don't you know that Carol's an alcoholic?" But agreed, it will be cool that so many more people will be exposed to the awesomeness of Carol who never would have been, even if they had already been casuals drawn into the funnybooks by the prior MCU films. And speaking of Cap Marvel in general, i'm guessing that they won't even touch the alcoholism thing, given the fact that the MCU has barely touched on Tony's alcoholism despite it being a significant part of his character in the comics for decades. And obviously they're not going to go anywhere near the whole "the Avengers ignored that she was being mind-controlled by an alien who essentially kidnapped and impregnated her, so when she regained control and returned to Earth she rightly told them all to Eff Off and lived with the X-Men for years" thing (whuch, to be fair, wouldn't be logical to do in the current MCU). But i know that if her cat (different name aside) isn't actually a Flerken, there's going to be hell to pay. At least now we know how Samual L Jackson lost his eye. Prefer the Warbird look personally. Tho the masked Mohawk is pretty cool too. Surprised Anti is excited about the Super Blood Wolf Moon. Why am I surprised? It's because it has the word "blood" in its name. How long did you take to come up with that jab. Just because Anti-Matter likes some kids games doesn’t mean he’s 100% man child. Just look at his adoration for Street Fighter and Dance Dance Revolution. I was excited for this until i found out it's going to be snowing here. Now i'm envious of the people in Indonesia because partial is better than nothing. I got updated information about Lunar Eclipse on 21 January 2019 will be not visible on Indonesia. But will be visible on America, Europe, Africa and some Asian territory. its dangerous to go alone!